Loomis Associates is now under contract with Great Rivers Greenway District to finalize construction documents for Cliff Cave Phase II Trails within the Mississippi River Greenway. A project team of Loomis Associates, Civil Engineering Design Consultants, McGinnis & Associates Structural Engineers, and Geotechnology Inc, headed up by Loomis Associates, will now begin final construction documents for this three mile extension of the Mississippi River Greenway. 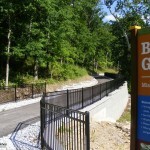 Project features include a pedestrian plaza at the Mississippi River overlook, a parking lot for 35 cars, a restroom, and more than three miles of asphalt trails climbing more than 160 vertical feet of terrain.